Purpose: In the present study we analysed the effect of comprehensive nursing intervention for patients with hypertensive cerebral hemorrhage treated by minimally invasive surgery. Method: We collected and analysed the clinical data of 2600 patients with hypertensive cerebral hemorrhage, who were received by hospitals from June 2013 to January 2016. These patients were randomly divided into two groups with equal number of patients, and both groups of patients were treated with minimally invasive surgery. After surgery, the two groups were applied with different nursing methods and named as comprehensive nursing group and control group, respectively. There are 1300 patients in each group. We compared two groups in terms of SAS and SDS scores, Fugl-Meyer score, and Barthel index before and after nursing treatment. Results: It was evident after nursing therapy, there are significant improvements for both groups in terms of SAS and SDS scores, Fugl-Meyer score, and Barthel index, wherein the comprehensive nursing group enjoys a higher degree of improvement. These parameters before and after nursing treatment are of statistical significance (P<0.05). Both groups of patients are subjected to different degrees of urinary infection and pulmonary infection during treatment, and the comparison between control group and comprehensive nursing group is of significant difference, P<0.05. Conclusion: After performing minimally invasive surgery for patients with hypertensive cerebral hemorrhage, it is necessary to adopt comprehensive nursing intervention, which can significantly improve the psychological status and movement function of the patients. Therefore it should strengthen the application of comprehensive nursing intervention in clinical practice. Clinically, hypertensive cerebral hemorrhage is a severe complication and also a type of stroke disease of higher disability rate . In clinical practice, hypertensive cerebral hemorrhage is normally treated with minimally invasive surgery, which can reduce the pressure effect of hematoma on patient's brain tissue, so as to improve the nerve function of patient . Clinical treatment shows that hematoma clearance treatment is of insignificant effect to hypertension, minimally invasive surgery should be more recommended. Minimally invasive surgery can enhance the recovery of movement function of patients and avoid severe complications in postoperative period. Wang et al. Reported that minimally invasive surgery is safe and effective in Hypertensive Intracerebral Hemorrhage (HICH) patients with a hematoma volume>50 ml. Due to its minimal invasiveness, better recovery rate, lower mortality rate, and less complications, this approach is considered superior to craniotomy . Some other studies showed that minimally invasive surgery is a safe and effective method in the treatment of hypertensive intracerebral hemorrhage [4-7]. A study of 112 HICH cases, including control group (50 cases) and the study group (62 cases), the former received conventional treatment, the latter minimally invasive intracranial hematoma surgery, they found that minimally invasive surgery for HICH had a better effect than conventional treatment . Furthermore, for patients with hypertensive cerebral hemorrhage, patients in the traditional treatment with psychological intervention nursing, can effectively improve the patient's treatment efficiency, promote the healthy quality of life, patients' satisfaction degree of nursing . However, it is very importance to seek feasible and effective nursing method for patients after the surgery. After performing local anaesthesia, we perform needle drilling skull and cause moderate amount of hematoma. Subsequently, we put drainage tube in patient's body, and then bandage and fix the patient. During perioperative period, comprehensive nursing group is applied with comprehensive nursing while control group is applied with conventional nursing. Therefore, in this study, we aimed to evaluate the comprehensive nursing intervention effect in treating hypertensive cerebral hemorrhage by minimally invasive surgery. The 2600 hypertensive cerebral hematoma patients who were received at different hospitals from June 2013 to January 2016 are selected for random observation. Prior to the observation, we get the consent of the patients and their families. In comprehensive nursing group, there are totally 1300 patients, wherein 578 are male patients and 722 are female patients. Of the 1300 patients, the oldest one is 74 y old while the youngest one is 38 y old, reaching an average age at 60.2 ± 3.4. The courses of diseases of these patients normally range from 4-12 y with average course of 5.2 ± 2.5 y. However in control group, there are 590 male patients while 710 female patients, wherein the oldest patient is 75 y old while the youngest one is 39, reaching an average age at 59.6 ± 3.6. The disease courses of these patients range from 5-13 y with average value of 4.9 ± 2.8 y. By comparing the general data of both groups, it finds that there is no significant statistical difference between both groups, so it is worth for putting both groups together for comparison. Both groups of patients are uniformly treated by minimally invasive surgery, wherein patients are given with hemostatis and diuretic therapy, and preoperative preparations are fully done . Patients' head is applied with scanning using CT plate, and then the 3D coordinate can be determined based on obtained scanning image. In the process of installing puncture, it should puncture bleeding part . Conventional disease inspection is given before surgery, close observation is performed during surgery and necessary diet guide and health education are supplied after surgery . Patents in comprehensive nursing group are given with comprehensive nursing intervention on the basis of conventional nursing; Prior to surgery, nursing staff should get a grasp of metal need and mental status of patients, and give them with necessary metal psychological counselling by telling them knowledge about surgery treatment and some successful treatment case; In the process of surgery, it should keep operating room clean and comfortable, and conduct real time monitoring for patients' breathing condition and blood pressure condition. Observe patients' pupil change conditions, give oxygen inhalation therapy and eliminate oral secretions. After surgery, fix drainage tube and restrain patients with mood disorders using restraint, and strictly control the plug-in time of drainage tube. Let patients eat foods with higher vitamin and protein contents while avoiding the intake of irritable foods . The Image of minimally invasive treatment for hypertensive cerebral hemorrhage is shown as Figure 1. 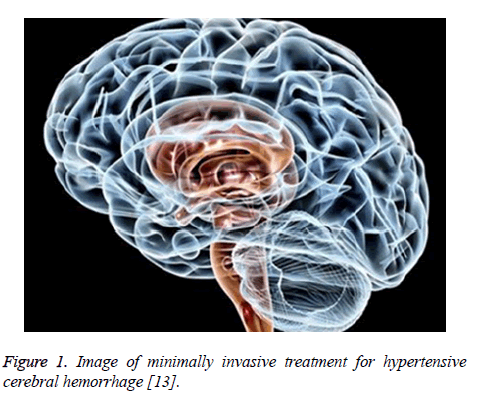 Figure 1: Image of minimally invasive treatment for hypertensive cerebral hemorrhage . For hypertensive cerebral haematoma patients in this research, the clinically obtained date are subjected to inspection using software package SPSS17.0, wherein, clinically obtained enumeration data is represented by (n, %) and inspected by; measurement data obtained in diabetes treatment is represented by (͞x ± s) and inspected by t-value. Through statistics of the data obtained from both groups, it can conclude P<0.05, indicating curative effects between two groups are of significant difference. Through comparing indexes between before and after nursing intervention of both groups, it can find there are significant improvements of indexes after nursing intervention for both groups, wherein the comprehensive nursing group achieves a higher degree of improvements of indexes, with significant statistical difference. Therefore, it indicates that comprehensive nursing intervention can achieve more significant nursing effect, shown as Table 1. Table 1: Comparison of improvements (͞x ± s) of Fugl-Meyer and Barthel index between before and after nursing intervention of both groups. Through comparing anxiety situations between before and after nursing intervention of both groups based on SAS and SDS scores, it can find that patients in control group do not enjoy a significant reduction of anxiety, while patients in comprehensive nursing groups do, so that the curative effect of surgery can be increased . This illustrates that during conducting minimally invasive surgery for patients with hypertensive cerebral hemorrhage, conducting comprehensive nursing intervention can effectively relief the anxiety mood of patients, so as to let patients treated in a relax atmosphere, getting an increasing confidence of overcoming disease and achieving a better curative effect. By observing perioperative complications of both groups, it can find both groups of patients are subjected to different degrees of complications after surgery, wherein the complications of comprehensive nursing groups is not so significant as that in control group. After scoring the nerve functions of patients in comprehensive nursing groups, it finds that the scores are significantly different from that of control group . Comprehensive nursing cannot only improve nerve function and coma situation, but also improve patient's living ability as well as their satisfaction on medical staff. Hypertensive cerebral hemorrhage is a phenomenon of primary parenchymal hemorrhage. As a type of common neurology disease, such disease is of very high disability rate and fatality rate. There are numerous treatment methods for hypertensive cerebral hemorrhage and there is relative large pronostic difference between different treatment methods . At current stage, with the continuous development of minimally invasive drainage surgery, minimally invasive surgery has been widely used in clinical treatment. With the development of modern medicine and nursing, nursing working during perioperative period has become very critical. For patients with hypertensive cerebral hemorrhage during perioperative period, comprehensive nursing can be performed according to the feature of each patient individual, so that patients can have more trust on nursing staff and nursing working can be completed more effectively . In the process of conducting comprehensive nursing, it should focus on the improvements on patients' nerve function disorder, so as to enhance patients' live ability and increase their satisfaction on medical staff, making doctor-patient relation and nurse-patient relation reach a new development stage. For hypertensive cerebral haematoma patients, minimally invasive surgery is a safe and effect method which can effectively eliminate intracranial hematoma. In the treatment of patients with combined disease of hypertensive cerebral haematoma and other diseases, such treatment method is very effective. This treatment can also strengthen mental protection of elderly patients, which is positive to the recovery of body function. In addition, it can also prevent complication after surgery. After surgery, by applying rehabilitation training of language, body movement and cognition, it can enhance the recovery of patients' nerve function . The exertion of comprehensive nursing measures is totally complied with social psychology mode and capable of enhancing nurse-patient relation. In this process, the role of nurse can be fully exerted, which is of effect improvements on prognosis condition of hypertensive cerebral haematoma patients after surgery . Hypertensive cerebral hemorrhage is a common and the most serious complication with high fatality rate and disability rate. In practical practice, treating hypertensive cerebral hemorrhage with minimally invasive surgery can effective eliminates brain hematoma, so as to improve the nerve function of patients. Therefore, minimally invasive surgery has been widely used in clinical practice for treating hypertensive cerebral hemorrhage. For patients in perioperative period, perform comprehensive nursing according to specific condition of each patient can effectively improve daily living ability, enhance body rehabilitation, and improve the relation between nurse and patient. Due to the full exertion of role of nursing staff, the prognosis effect of patient can be more significant. Biessels GJ, Zwanenburg JJM, Visser F. Hypertensive cerebral hemorrhage. Neurol 2010; 13: 144-146. Pang L, Zhou L. Comparison of minimally invasive surgical methods on hypertensive cerebral hemorrhage. Chinese J Minim Inv Neurosurg 2001; 9: 277-278. Wang W, Zhou N, Wang C. Minimally invasive surgery for hypertensive intracerebral hemorrhage patients with large hematoma volume: a retrospective study. W Neurosurg 2017; 105: 348-358. Lin XD, Zhao L, Wang XM. Clinical study of minimally invasive surgery for hypertensive intracerebral hemorrhage. Chinese J Neuromed 2005; 18: 498-500. Newell DW, Shah MM, Wilcox R. Minimally invasive evacuation of spontaneous intracerebral hemorrhage using sonothrombolysis. J Neurosurg 2011; 115: 592-601. Fiorella D, Arthur A, Bain M. Minimally invasive surgery for intracerebral hemorrhage: rationale, review of existing data and emerging technologies. Stroke 2016; 47: 1399. Zhong Z, Sun Y, Zhou H. A new choice of minimally invasive surgery for intracerebral hemorrhage in the striatocapsular regions based on computed tomography scans. J Craniofac Surg 2014; 25: 1195-1199. Jia C, Hospital HP. Analysis curative effect of minimally invasive intracranial hematoma surgery for hypertensive intracerebral hemorrhage. China Cont Med Educ 2016; 19: 623-625. Yang Q. The application value of psychological intervention in the treatment of hypertensive cerebral hemorrhage. China Cont Med Educ 2016; 8: 77-79. Fan H, Liu X, Zheng ZQ, Li HM, Liao HM. Analysis of comprehensive nursing intervention effect in treating hypertensive cerebral hemorrhage by minimally invasive surgery. J Nurses Train 2012; 23: 1681-1682. Zhong GY. Application of comprehensive nursing intervention in treating hypertensive cerebral hemorrhage patients with minimally invasive surgery. J N Pharm 2014; 13: 142-143. Wu YJ. Analysis the effect of comprehensive nursing intervention for hypertensive cerebral haematoma patient treated by minimally invasive surgery. J Clinic Med Pract 2014; 5: 8-11. He CY, Liang J, Zhang J, Meng RL. Analysis of clinical effect of comprehensive nursing intervention for patients with intracerebral hemorrhage treated by evacuation of hematoma caused by micro-invasive puncture surgery. J Nurses Train 2013; 45: 804-806. Liu XL. Analysis of comprehensive nursing intervention effect in treating hypertensive cerebral hemorrhage by minimally invasive surgery. Guide China Med 2016; 23: 223. Liu S, Liang CG. Effect of excellent comprehensive nursing in treating hypertensive cerebral hemorrhage minimally invasive intracranial hematoma. J Qiqihar Med Coll 2014; 10: 3721-3723. Li J, Jia Y, Wang F, Shi DD, Bai J, Ding W. Analysis of comprehensive nursing effect for hypertensive cerebral hemorrhage patients treated by mini-invasion removal of intracerebral hematoma. Contemp Med Forum 2014; 14: 107-108. Liang W. Analysis of nursing effect in treating hypertensive cerebral hemorrhage by mini-invasive evacuation of hematoma. Jilin Med J 2015; 5: 1704. Rui SY. Nursing countermeasure in treating hypertensive cerebral hemorrhage by microinvasive drainage and effect analysis. J Baotou Med Coll 2015; 13: 121-122. Chen XR. Observation of comprehensive nursing intervention effect in treating hypertensive cerebral hemorrhage with minimally invasive surgery. W Lat Med Info 2015; 12: 188.